Chanel has a fairly consistent fragrance sector as many of their creations have become classics, or just have that classic and sophisticated smell. Talk to anyone with some sense of the perfume industry and ask them if they know about Chanel No.5. Their eyes should light up. If they don’t, it’s a sad day in fragrance history. Much like most things House Chanel puts out, Allure has that classic and sophisticated feel. It’s a modern fragrance, to be sure, but it also has this sense about it. This unspoken aura that proclaims loudly and proudly that it is a perfume and it is not going anywhere, anytime soon. In Bottle: Slightly powdery, sweet feminine fragrance. I’m thinking of sweet florals, a warm field of flowers set in vanilla with the lingering threads of alcohol. Allure is a modern fragrance, claimed to be built in a special way so the wearer can enjoy a unique experience atypical of other perfumes. But then, so many new perfumes also have that claim. Right now, Allure is a nice strong but welcoming warm vanilla floral. Let’s see how she does applied. Applied: Immediately I smell the vanilla coming up on the sweetness and the florals. There’s a creamy quality to this that replaces that powder I smelled off-skin. This mixture of warmth and sweetness makes Allure a golden fragrance to my nose.It reminds me of L’Instant de Guerlain in color and sweetness but L’Instant had a distinct amber and honey feel that Allure doesn’t possess. Allure instead is backed by a fine mist of soft florals as it trails off into sweet, creamy vanilla. Extra: While Chanel has enjoyed success as a major fragrance house. Particularly thanks to the ever present and ever iconic, No.5, it has also garnered some reputation of making “old lady” perfumes. The powdery scent in these might be doing it but I also think it’s in part due to the brand’s reputation. I smell Allure and get nothing but sophisticated and modern. “Old lady”, of course, has different connotations to different people but it’s hard for me to associate Allure to an old woman. Allure is simply a sweet, vanilla floral. Design: Allure’s bottle design, much like most of Chanel’s other fragrances, is minimalistic but functional and beautiful at the same time. Presented in a tall, clear rectangular bottle, the name of the fragrance is embossed near the top while the fragrance house, other vital information is embossed on the bottom. While the design itself does look similar to that of Burberry Brit, you can literally feel the better quality that was put into Chanel Allure. It’s simple but refined whereas Brit’s bottle just looks like a mishmash of poor design decisions. Yes, I am still harping on Burberry Brit’s bottle. The bottle cap is metal with a ring running its perimeter with CHANEL written on it. Simple but elegant. A great design for those with minimalist tastes. Notes: Lily of the valley, magnolia, honeysuckle, citrus, passion fruit, mandarin, jasmine, rose, vanilla. One of the best things about trying different fragrances is finding out what I like. In L’Instant and Allure, I’ve discovered a love for golden, warm and sweet creamy fragrances. Something that doesn’t quite touch the shores of gourmand but skirts the outer edge. 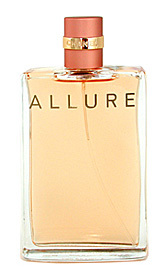 Reviewed in This Post: Allure, 2010, Eau de Parfum. This entry was posted in chanel, floral, oriental, Reviews By House and tagged allure, bottle, chanel, design, fragrance, sweet, vanilla. Bookmark the permalink.